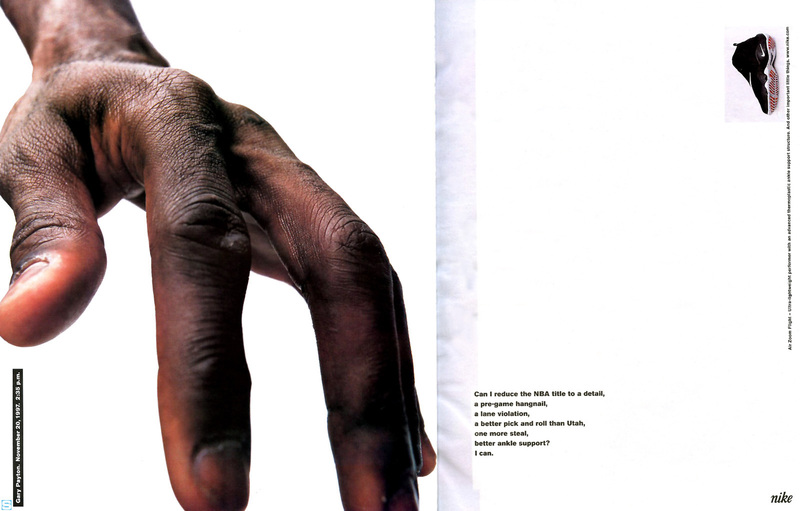 The Glove and Gary Payton's hand in today's Vintage Ad from 1998. This ad is a little late for all the hype surrounding the first-ever return of the Nike Zoom Flight '98, also known as The Glove, Gary Payton's iconic shrouded signature shoe. But seeing as how the shoe is still in stores in new colorways, I figured posting it now would be one of those instances of "better late than never". Anyway, here we have an awesome two-page ad for The Glove from the same campaign as this Scottie Pippen ad for the Air Pippen II. Instead of a close-up of Gary's nose like in Scottie's ad, we luckily only get a zoomed-in look at Gary's hand. Fitting, I guess, since both he and the shoe are nicknamed The Glove.